Let’s be honest, when was the last time that you looked inside your furry friends mouth? In this busy world of brushing our own teeth and trips to the dentist, it’s not often that we stop to consider that perhaps our pets may suffer similar issues with their teeth and mouths. For those of you that visit the vet hospital frequently, you may notice that one of the first things our vets do is check inside your pets mouth. The oral cavity is a spot that helps your pet health care provider to check for signs of illness and dental condition and is often the gateway to good pet health. Lets face us, there are all sorts of things that go in there along with food – bones, sticks, treats, dirt, wool are just to name a few and there are many others. When your vet checks out your pets oral cavity, we are looking for signs of general illness and then typically we will focus on understanding the situation on any dental disease like plaque, cavities and any overcrowding that your pet may have. Our biggest concern is the impact dental disease can have on vital organ function such as heart and kidneys but also the undetected pain that your pet may be in due to infection or fracture of teeth. Dental disease in pets is very common and although some pets are born with a higher likelihood of suffering from poor dental health, often it is what we are feeding and how often we feed them that is the big contributor. 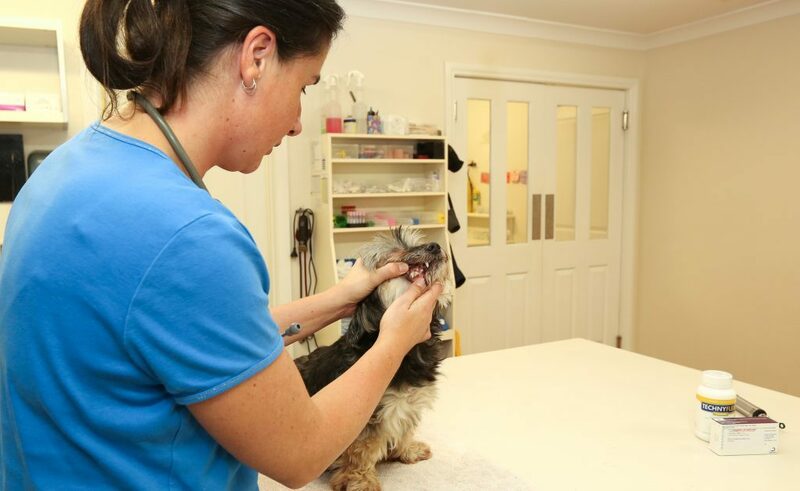 Unfortunately most vet hospitals run very busy aiding pets with tooth restorations and extractions. The good news is that we are able help pets a lot more with the advancement of dental radiology, instrumentation and the availability of great foods and in home dental care for the delay and prevention of future oral disease. Get your pet comfortable with handling their mouth by checking under their lips and around their teeth daily and start this early in their lives. Talk to your vet about what is normal for your pets teeth and mouth so that you are able to pick an abnormality faster. Consider daily brushing or wiping of the outer surfaces of the teeth with dental wipes to optimise dental hygiene in your pet. Consider good quality dental chews rather than too many bones that can lead to weight gain and excessive tooth wear and fracture. Be sure to set those regular checks with your vet. Six monthly is recommended and some veterinary hospitals offer a free yearly dental check. Remember, it all starts at the top and the mouth is an all important part that has a big bearing on the overall health of your pet.